Here at Techniques, we undertake all types of service and maintenance work on all Morgan models. This can range from a routine service to a full mechanical overhaul. Morgans benefit from regular servicing to maximise your enjoyment and to minimise future repair costs. The traditional cars require a lubrication service every 3000 miles and a full service every 6000 miles or annually. In most cases, the Morgan is often a second car for our clients, resulting in very few miles covered over the annual period. Here at Techniques we recognise this and endeavour to service the car accordingly. Once we have got to know the car well, understand what the customer has planned for the car in the coming 12 months, we service accordingly. Often cars can be over serviced, resulting in a large bill at the end. We will try to spread the costs and service the car relevant to what was carried out at the previous service. Wear in the sliding pillar front suspension can be minimised by regular greasing and oiling. However, in our experience, king pins require replacing approximately every 15,000 to 20,000 miles. The Morgan Aero range of course dispenses with sliding pillar suspension, yet a lubrication service is still recommended every 5,000 miles and a full service every 10,000 miles or annually, again whichever is the soonest. 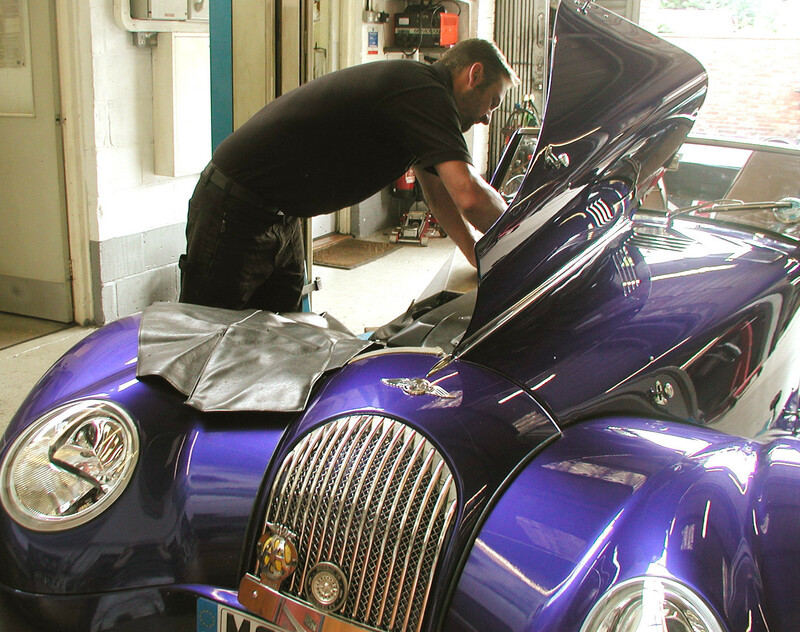 Armed with the latest factory diagnostic equipment our experienced technicians are able to efficiently complete an annual service according to the requirements of the Morgan Motor Company. We can complete an annual service while you wait, or if more work is required provide you with a loan car or a lift to one of two main line stations. We can also collect and return your car if you are unable to travel to our workshops. 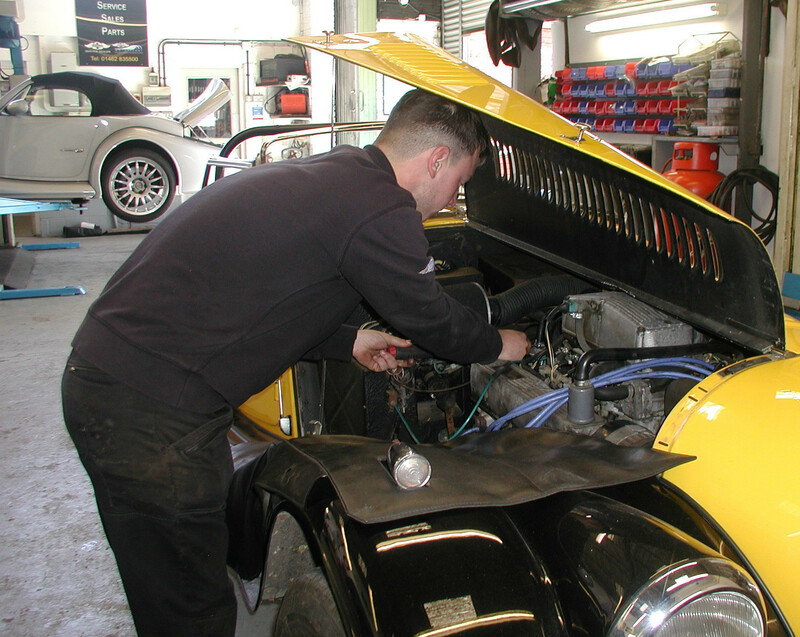 Servicing of your Morgan and the MOT go hand in hand and Techniques are able to have an MOT carried out with very little notice. The MOT can be carried out 30 days before your expiry date, allowing you to keep the extra days and we can also MOT Morgan 3 wheelers. As an approved Morgan Service Dealer, we are able to rectify faults with your new Morgan under the Morgan Motor Company warranty scheme, regardless of where it was purchased. Be it any mechanical, electrical or any other rectification work required, Techniques will be delighted to assist in dealing with your request. Prior to the winter season many of our customers are having their Morgan serviced and waxoyled. As well as the regular service items, we will check the condition of the battery and the strength of your anti freeze and the waxoyl treatment will help prevent corrosion to the metalwork. This will ensure your Morgan will be safe from freezing and remains reliable during the dark winter months. Early Morgan chassis were powder coated, which over the years will have flaked away, exposing the bear steel chassis. Here at Techniques we offer a chassis treatment and waxoyl service, scraping back the old paint from the chassis, applying a coat of rust prevention and an oil based paint, followed by two coats of waxoyl. This will then keep your car safe from the salty winter roads for a number of years, requiring only a small top up at your next annual service. If you do not already have a CTEK battery charger and conditioner fitted, we would highly recommend you do so, this will ensure the battery is kept in top condition throughout the winter months.